Watching this man rescue a sparrow frozen to a fence will melt even the iciest of hearts. We humans love to complain about the agonies of each brutal midwinter: the frigid temperatures, the piles of ice and snow, the seeming impossibility of going out to meet your friends anywhere. But the rest of nature has to cope with this garbage season absent any mitigating factors like, say, indoor heating. Which is to say, when an animal runs up against a very January problem, it's nice if we can lend a hand. 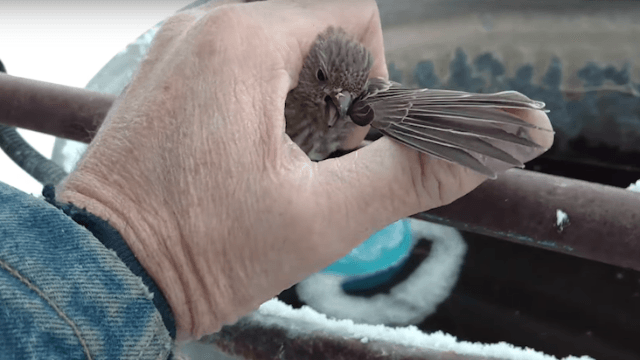 Such was the case for Idaho resident Nelson Wilson, who on New Year's Day encountered an unlucky little bird: While feeding his horses, he "noticed a solitary sparrow perched upon the steel fence near the water tank," he wrote on YouTube. "The tank is heated to keep it from freezing. It is not uncommon for birds to drink from the heated tank. Apparently this unfortunate bird had gotten its feet wet and, while making its exit, had become frozen to the fence in the prevailing near zero Idaho temperatures." With all the gentleness of a Disney Princess, Wilson warmed the frightened bird in his palm and used hot breaths to melt the ice around its feet. In the end, the sparrow was freed and chirped a happy thank-you as it zoomed away. So, how about you? Have you freed any creatures from winter's icy grip today?